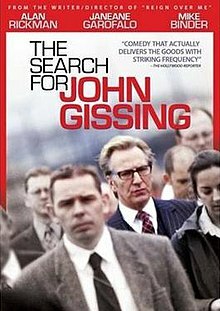 The Search for John Gissing is an award-winning comedy film written and directed by Mike Binder, produced by Jack Binder, and starring Alan Rickman, Janeane Garofalo, and Mike Binder. The movie is set in London. Tagline: An American businessman (Mike Binder) and his wife (Janeane Garofalo) have their lives turned upside-down by the British co-worker (Alan Rickman) he has unknowingly come to replace. The film won Best Picture at the 2002 Sarasota Film Festival. Matthew Barnes is a young executive on the move up who finds himself a pawn in corporate in-fighting when he's sent to London to oversee a merger. He's to replace John Gissing; Gissing's gotten wind of it, and he makes sure that Matthew and his wife Linda, who has dutifully but reluctantly come to England, have a miserable first few days there. By the time Matthew figures out what's happening and declares a counter offensive, it may be too late to save himself from a transfer to Detroit. With Gissing still holding lots of cards and Linda more unhappy by the moment, Matthew must reevaluate. All out war? A partnership with Gissing? Some third way? Not having found an appropriate distribution deal, Sunlight Productions set the film aside following its festival premieres. Shortly thereafter, an online petition was formed in a plea for the release of the film, garnering more than 3,000 signatures. Mike and Jack Binder's Sunlight Productions made the film available online. This film was released on UK DVD by Simply Media 2 July 2018.